Just as you can mark the Moon’s position each night against the fixed stars and constellation patterns, you can mark the planets, too. The planets also make paths against the fixed stars. Over the course of a year, these paths join into one line that circles the entire sky. This line is known as the zodiac, and its more scientific name is the ecliptic. Contrary to popular belief, however, the zodiac actually has 13 signs, not 12. The thirteenth sign is called Ophiuchus the Serpent-bearer. Don’t worry if you’ve never heard of him – most people haven’t! 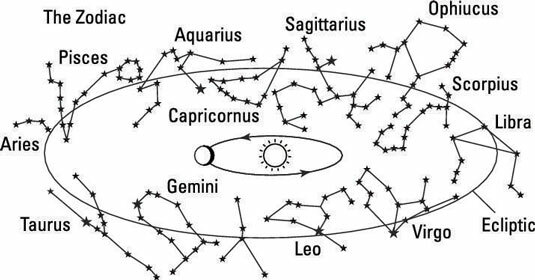 He sits between Scorpius and Sagittarius, and so the Sun, Moon and planets all spend a bit of time in Ophiuchus each time they move around the sky. Whenever you see a planet, the Sun or the Moon in the sky, it always lies somewhere in one of the signs of the zodiac. You can find out where a planet is on the ecliptic by looking it up online – a search for ‘Jupiter position April’ should give you lots of websites that will tell you where to look for Jupiter in April. Alternatively, you may want to subscribe to an astronomy magazine. These monthly publications list all the planets that are up in the sky for the particular month, and feature maps that show you where to find them.